Danielle Houghton is a Street Photographer from Dublin, Ireland. She has been in love with photographer ever since she was a teenager and has been street shooting constantly since 2010. She is massively attracted to the “odd in the mundane and find[s] that suburban life can be nicely quirky”. Her photos are colourful, surreal and humorous and just a joy to look through. She feels that the real beauty of photography comes from the individuality of each and every one of us and the unique moments we all live that can never be repeated. Danielle has had her work exhibited in London, and has also won a couple of Street Photography competitions, the Urban Picnic International Competition and the London Transport Museum’s ‘Sense the City’ competition. Danielle is not only part of the “OBSERVE” international photography collective but she is also its founder. The “OBSERVE” collective is focused mainly on the practice of candid Street Photography. You can find out more about “OBSERVE” and the rest of the members of this amazing collective at http://www.observecollective.com. Danielle is the second member of this collective that we have featured. In August 2014 we also featured the charismatic Chris Farling. 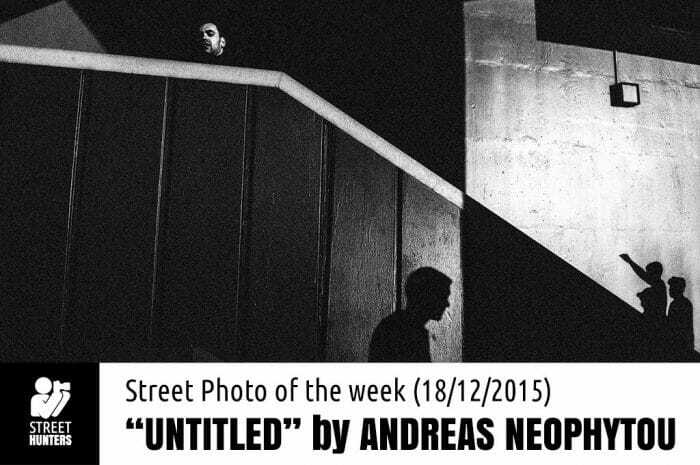 Welcome to the first Street Photo of the Week for 2016! 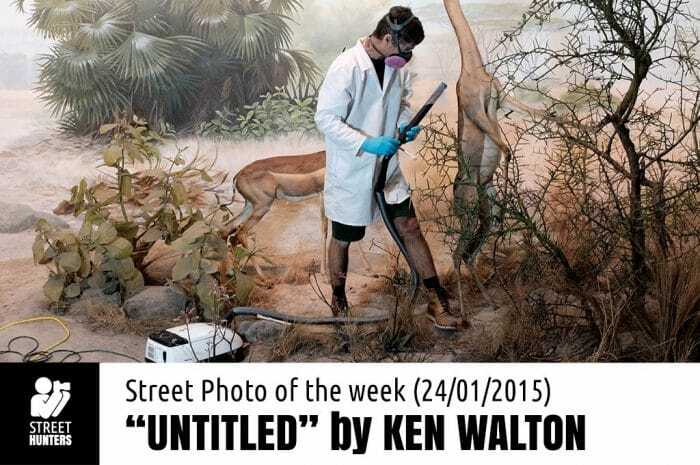 I have been meaning to write about Ken Walton for some time now, ever since I saw one of his photos on the Streethunters.net Readers Flickr group a few months ago. I have been keeping my eye on him through the group and always find his work most interesting. But who is Ken Walton? Andreas Neophytou is a Street Photographer that is from Cyprus and is currently based in sunny Nicosia. Andreas is a professional photographer, but not the type of photographer you usually happen to meet. He is a Police Photographer and Crime Scene Examiner. Personally I think that is highly interesting and exciting. Images of Weegee come to mind, shooting the crime scenes of NY in the 30s. When Andreas isn’t shooting crime scenes, he shoots in the streets of Nicosia. He is a highly talented Street Photographer that understands light and shadows and has a keen eye for interesting compositions that make a photo pop. He has a preference of shooting close-up and wide. He likes capturing colour and black & white and photographs from various points of view and angles. Taking a look at his portfolio, one sees a plethora of very interesting photos. Andreas is a part of the B.U.L.B. collective, as well as the In[+]frame collective. He is also a member of the Streethunters.net Readers Flickr group that is slowly growing into one of the best Flickr groups on Street Photography! 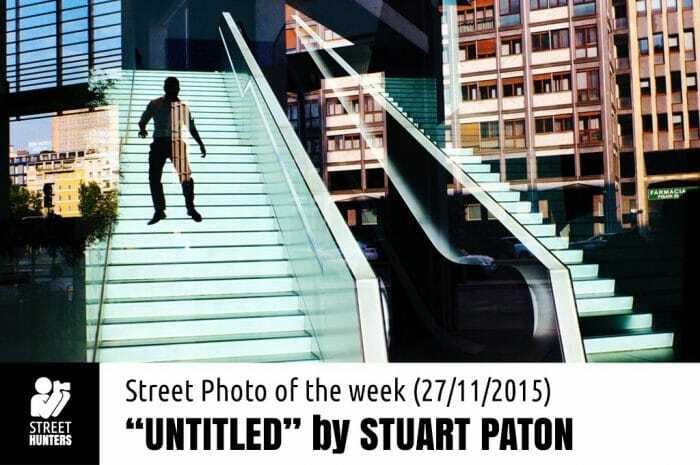 This week we are featuring a photograph by Street Photographer Stuart Paton. Stuart Paton is originally from Scotland, UK. These days he shoots and lives in France. Stuart has been interested in photography since he was a child. His dad used to have a dark room under the stairs in their home. Once Stuart had an understanding of photography, developing and printing he started using that darkroom to print his own photos. His father was his inspiration and the person who stimulated his interest in the art of image making, as well as the influential work of war photographer Don McCullin. Stuart’s work came to our attention through our ever growing Flickr Group. We feel very lucky that we have such a vast library of amazing photos at our fingertips. 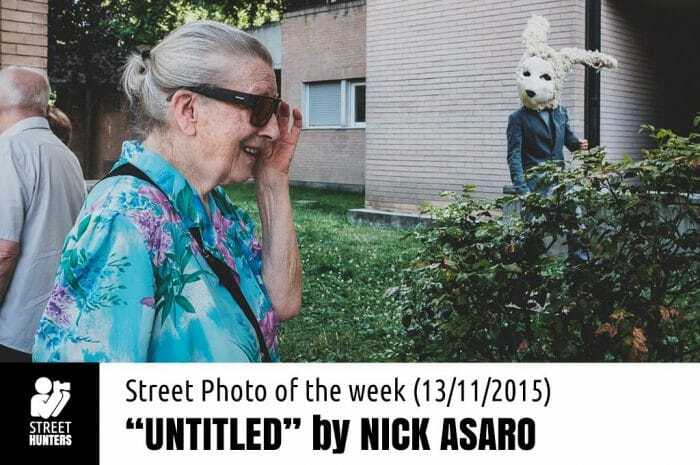 Nick Asaro is a Sicilian Street Photographer who is currently based in the picturesque Florence in Italy. Besides loving photography, Nick also likes riding his bicycle and playing the drums. 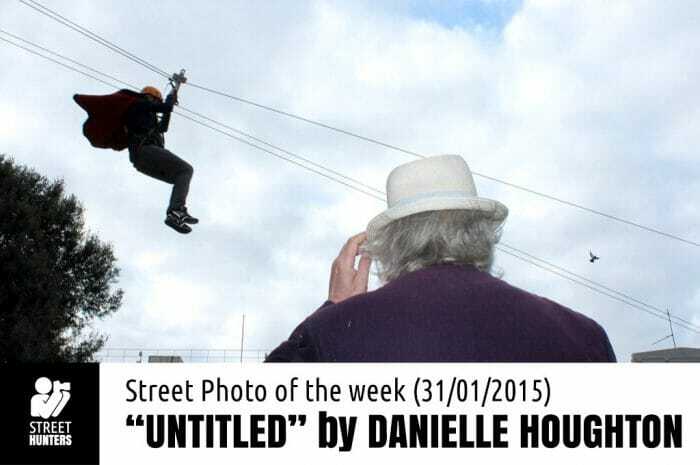 He has had his work published in the 3rd issue of “The Street Photographer Notebook” by Alex Coghe. Nick’s work has also been shared on the UclickVframe website and was a finalist on one of Eyeem’s contests. We discovered Nick in the ever growing Streethunters.net Flickr group that has become a treasure trove of amazing street shots from all over the world. We are very proud of this group. We recommend you visit it and join it! Jonathan Higbee is a Street Photographer who emphasises storytelling. As a photographer he aims to capture moments that can be explained in many different ways. The most important part of a photo for Jonathan is the message hidden behind it. 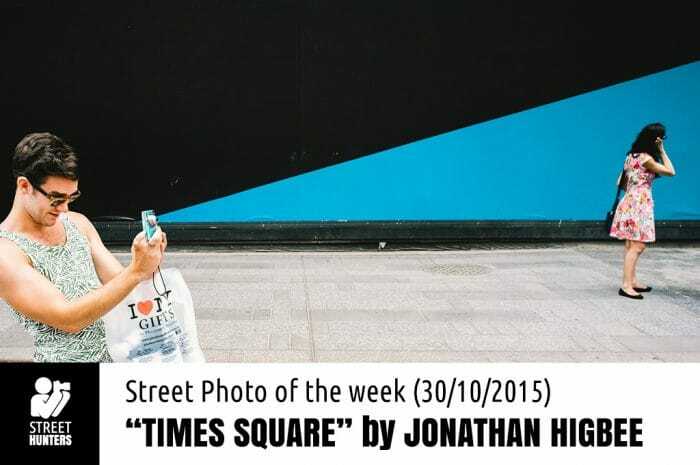 Jonathan’s work has appeared on leading blogs online and in national magazines. Unfortunately we don’t have any more information about Jonathan. We managed to find out that he is currently in New York, but we don’t know where he is originally from. We also saw on his Flickr profile that he is a Journalist. He has been mentioned on the Huffington Post, on the website of our Reader and Street Photographer Alex Coghe, on the World Street Photography Awards and on the 7th issue of the Street Photographer Notebook. 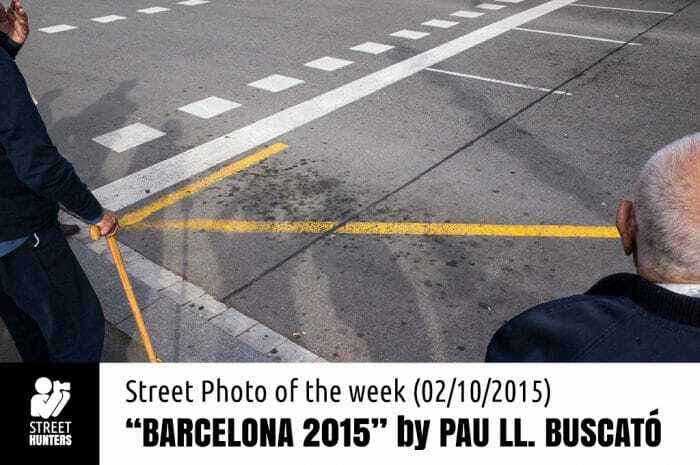 This week we are featuring a photograph by the amazingly talented Pau Ll. Buscató. Pau Ll. Buscató is a Street Photographer living in Oslo, Norway. He is originally from Barcelona. Before I continue, I would like to avoid any confusion in my writing by mentioning that the photographer’s name is “Pau Ll. Buscató”. The “.” is included in the name. Just keep that in mind when reading the post! Pau Ll. Buscató likes to add humor to his photos and he achieves this by creating unreal compositions that only a Master Street Photographer could realize. Just visit his Flickr page to understand what I mean. I bet you that your jaw will drop! From today Pau Ll. Buscató is on my personal TOP 10 Street Photographers of all time list. He is simply brilliant. Enough said. He is a member of The Street Collective that is an international group of photographers with main focus on Street Photography. You can learn more about The Street Collective on their website at www.thestreetcollective.com. 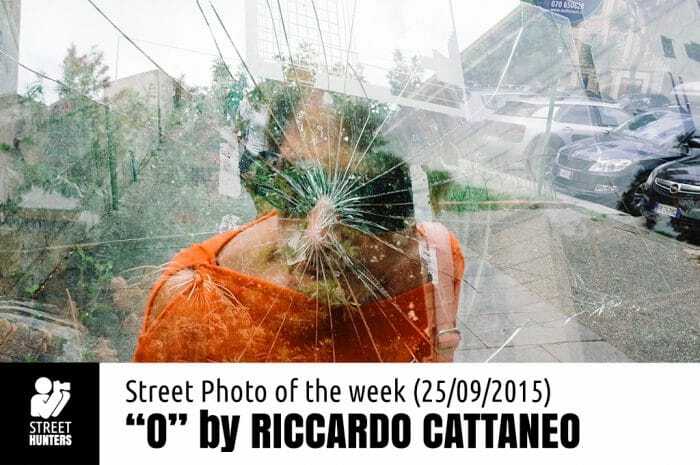 Riccardo Cattaneo is an Italian Street Photographer that is based in Milan, Italy. He is a member of the Streethunters.net Readers Flickr Group where he regularly gets his photos published. Besides being a talented Street Hunter, Riccardo is also a graphic designer so he has a natural appreciation of composition and understanding of colour. These inherent skills have surely helped him with his Street Photography, because the work he produces is highly interesting. Some of you might know him by the name of Gerbi which is what he usually calls himself on Social Media. Gerbi’s work is colourful and exceptional. His images have a surreal quality to them and just by looking at them one understands that the person behind the lens knows his stuff. 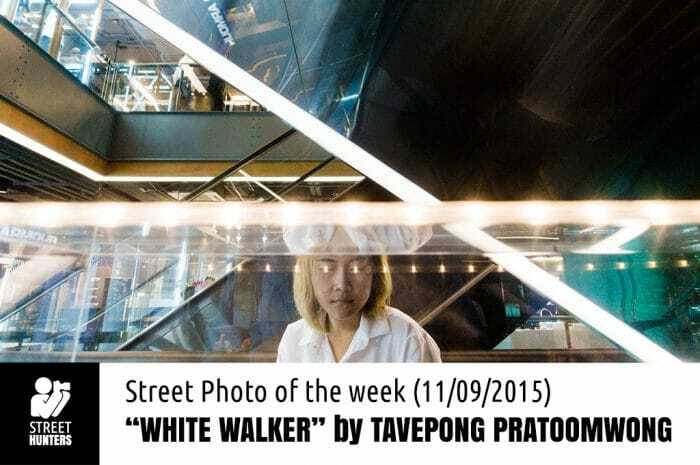 Tavepong Pratoomwong is a Street Photographer from Chanthaburi in Thailand. He has an amazing vision and all his photos have a story to tell combined with a great sense of humor. He shoots in colour and uses that colour to his advantage in a very clever way. Tavepong is a dedicated member of the Streethunters.net Flickr Group and we are pretty psyched about that. When scanning through his images it’s easy to see his tremendous talent. Each and every one of his photographs is so insane, and so bloody awesome you can’t help but gawk. Tavepong is one of those Street Photographers that everyone wishes they could be. He is exceptionally gifted and a true seeker of perfection. His photos are so good that each time you look at them it feels like you have discovered something new in your life. 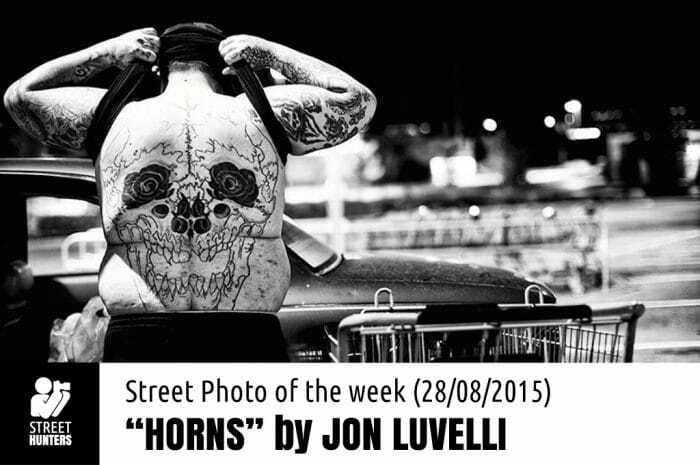 Jon Luvelli is a Street Photographer from Missouri, USA. He aims to capture emotion through his work and to send messages to his viewers through his photography. Luvelli has been commissioned by Universal, Warner Brothers, and Nike, among others for his art.